The benefit of securing space for your studio. Information and deadlines for registration payments. Information about our policies for refunds and credits. Our payment policies are in place to control deposits, registration payments, credits and refunds as necessary. They are as flexible as possible, however, the dates declared on the website, in event communications and invoicing are not negotiable. We have established and communicated these policies for your understanding, appreciation and acceptance to help ensure we can deliver great events. 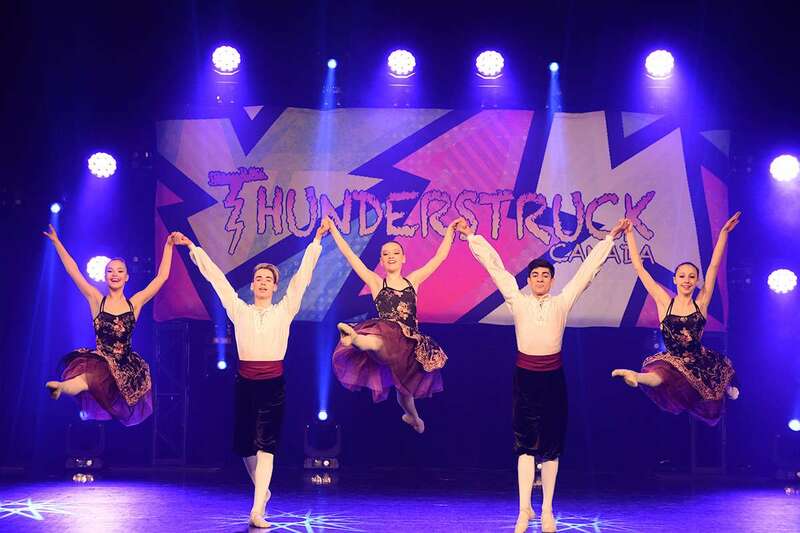 Thunderstruck Canada's success builds on strong leadership and a superb team of dance professionals. Without the support of studios, teachers, parents and dancers we would not be here today. We thank you for your support and will be working hard to continue to bring forward leading edge dance experience for you. Deposits made with Thunderstruck Canada provide a studio with the opportunity and comfort to reserve space for an event. We guarantee space for you based on the number of routines you provide with your deposit. It also gives you the flexibility to worry about your registration at a later date. You have until sixty (60) days before to complete your registration. Deposits are non-refundable but can be transferred to another regional event either within the competition year or in the future if declared 90 days before the event start date. Deposits abandoned within ninety (90) days of the competition are not refundable. Entry Fees are due forty-five (45) days before the competition. Entry Fees are considered to be any registration made online through our registration system regardless of payment status at the registration deadline. Whether you are a Studio or Independent, your entry should be complete by this time. We accept registration payments by cheque, money order (draft), e-transfer, wire transfer or credit card. For wire transfers, there is $25 fee. The convenience of credit card payments is available for a 2.9%. Under no circumstance will a dance be allowed to perform with a balance owing. Independent Entries must be paid before they will be processed into a competition schedule. Ninety (90) days: Registration fees (less any deposit made) are fully refundable. Sixty (60) days: Registration fees (less any deposit made) are transferable. You may transfer to another regional or future event. Forty-Five (45) days: Registration fees are not refundable and subject to Thunderstruck Canada's cancellation fees. Scratches: There are no refunds for entries that fail to perform at the competition, except for medical injury. We understand and appreciate that particular circumstances arise from time-to-time. For instance, you may have a dancer who is injured and not sure if they will be able to complete. It is much easier to remove them from the system if they can not dance versus adding them late. But this, of course, becomes an issue from our standard policies. If you have a particular circumstance, please let us know, and we can make the necessary recommendations and best accommodate you. Otherwise, the Cancellation Fees and Medical Credit policies will be in effect. A doctors note must accompany a request for medical credit. Within forty-five (45) days of an event start date, we refund 100% of the fees to the studio. Within thirty(30) days, we will credit 100% towards a future event. Injuries sustained at the competition are non-refundable. Please submit any requests for refund, transfers or medical credit at https://studios.thunderstruckcanada.com/submit-ticket and include all of the pertinent information. Routines or registrations cancelled within the forty-five (45) day window before the competition start date are not refundable. Regardless of payment status, these fee's remain owing to Thunderstruck Canada. For situations other than medical we will work with you to provide credit for a future event. However, cancellation fees may be applied depending on the proximity of the cancellation to the event date. Cash awards are now automatically applied as a credit to next season, noted in the checkout documentation. If you would like to receive a cash payout or defer to another event, please let us know.